Using a 13mm socket, remove the bolt holding the headlamp to the right hand headlamp bracket. Fit the right hand screen mounting bracket on the headlamp bracket and refit the bolt. 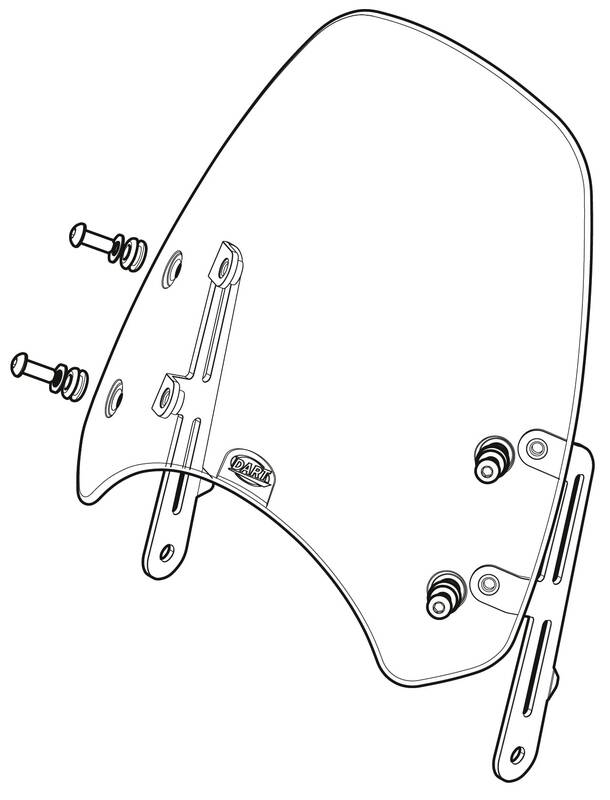 If your bike has a rubber mounted headlight (up to 2009 model year) make sure the large washer is on the outside of the screen bracket, so the screen bracket bears directly onto the rubber mounting. If your bike has the later, rigid headlight mount, then place the screen bracket outside the large washer, and then fit the bolt. In both cases, ensure that the triangular step at the back of the screen mounting bracket is resting fully on the headlamp bracket before tightening. Fit the top two machine screws. Note that the screen is held by a small amount of tension and the brackets may have to be forced slightly to accommodate this. Once everything is in position, gradually tighten all the screws evenly until they are seated on the brackets.